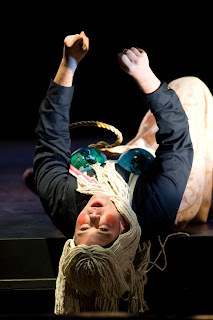 Emily Hindrichs, as Tytania, intends to raise the orphaned changeling boy as her own. 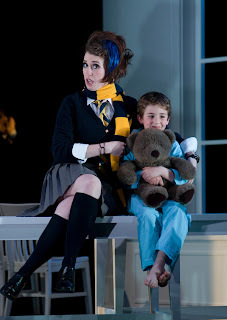 Emily, who sported a red mohawk as Feu (as well as Princesse/Rossignol and Nella/Lauretta) in ENFANT/SCHICCHI in last season's Young Artists Program, recently made her English National Opera debut as the Queen of the Night in Mozart's Magic Flute. 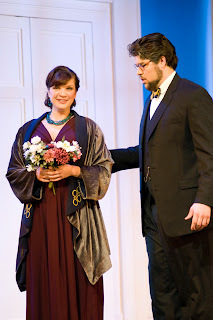 Helena (Michelle Trovato) and Demetrius (Michael Krzankowski) are reunited in love by the end of the opera, thanks to Oberon's magic love-juice. Hippolita (Rose Beattie) and Theseus (Jeffrey Beruan) are Headmaster and new Headmistress at the school of Athens, in this production. I'm happy to report that the opera really came together at last night's rehearsal--it helped to have a big invited audience laughing at all the jokes--and we're looking forward to a terrific opening tomorrow.